If humility consists in resisting the pressure of pride—whose power we can sense—it most certainly requires an effort. As all efforts, it needs to be justified, for after all, if the illusions of an oversized ego are part of my fundamental nature, and as long as they remain within the limits of reason, why try and rid myself of them—assuming this is even possible? The first reason is ethical and refers to what has been called “love of truth”. While it is in my nature to be blind to the true place I hold in the world, it is also in my nature, once I have become conscious of an illusion, to try and free myself from it. No one can content themselves—unless they are spiritually dead—with living knowingly in error without trying to come clear. We are naturally inclined to seek truth, whatever it may be, even if it is unpleasant for our ego. Given that pride is founded on lies and illusions, it is our ethical duty to strive to become more humble so as to free ourselves from these lies and to come closer to the truth of what we really are. The second reason is psychological. If we think about it, pride is the origin of most of our psychological suffering. The problem with pride, as we have seen, is that it makes us maintain a vision of ourselves that does not correspond to reality and is therefore constantly challenged by it. Life relentlessly reminds us of the very painful fact that we are neither the centre of the universe nor at the top. No less relentlessly, we try and put together strategies that will help us deny the obvious. Our delusional ego is like an oversized boat letting in water on all sides and we spend enormous amounts of energy trying to seal the leaks in order to keep the illusion alive at all costs. The following character types can give us some clues as to the way things happen concretely. The dishonest type—When their ego is confronted with an unpleasant message, they ignore the blow by attacking the source of the message. For instance, if they are being criticized, they will find some reasoning to discredit the author of the criticism or put words into that person’s mouth (“he said that because he doesn’t like me…”). When faced with a failure or difficulty, they will systematically put the blame on others and never question their own behaviour. The shy type—The strategy they use to uphold their illusions is to retreat and try to avoid the blows dealt by reality, as much as possible. They live in a state of fear and paralysis and remain still, whatever happens, to avoid awakening that painful reality. The “I am worthless” type—These people can see the illusory nature of their ego and are aware of their insignificance. As they realise they are not at the top, they view themselves as being at the bottom and it makes them miserable because deep down they believe they deserve a higher position. The illusion is still there, although in a devious way, and they hold tight to it. There are of course an infinite number of other examples that might be developed later in the comments. My goal in presenting the above character types is simply to show the direct role pride plays in our moral weaknesses and psychic suffering. The distinctive mark of pride clearly appears in every type: pride leads to erroneous judgement, both of ourselves and of others. Humility, as opposed to pride, enables us to become ourselves again and to finally align with reality. It helps us put an end to the vain and useless agitation of the ego and regain some form of stability: when I am humble, I know I am “almost nothing”, but this “almost nothing” is well grounded in solid reality. Thus, and contrary to what one might imagine, humility is a strength, a source of self-confidence and energy. How can one develop this quality? Here are some tips to get started. Tip No.1: The first step requires that I become conscious of the fact that I live with illusions. Leaving denial behind and remembering—even if a bit abstractly—our real place on earth is a form of self-suggestion that educates our thoughts and helps prepare for actual work on humility: I am not the best, nor the best-looking, not the most intelligent, nor the most cultured, not the most brilliant, nor the most popular; I am not the most admired—and who cares! Yes, I make mistakes, a lot of them actually, what matters is to learn from these mistakes and to progress. Showing the entire world what I can do is not an absolute necessity, in fact, that wouldn’t be of any good to me. If someone has more than me, no need to hate them or to think life is unfair. Instead, I should be happy for them and try to make the necessary efforts to get ahead myself. No, I am not indispensable, and yes, I have plenty of qualities and strengths, but where do they come from? How could I take credit for all that, when I know I can lose everything overnight? Etc. Tip No. 4: Accept criticism. Generally, our first reaction when we are being criticized is to feel attacked and to immediately set up a series of defence or flight strategies: we defend ourselves before thinking about the problem, or try to discredit the person who is criticizing us so as to automatically cancel out the validity of what is being said (“He says that because he’s jealous; he doesn’t see the whole picture, he has no idea how complex it is…”). We focus all our attention on secondary issues to avoid thinking about the core of what is at stake (“He spoke aggressively to me and was unpleasant; why did he have to say that to me in front of everybody? How incredibly rude!”). Breaking down and getting depressed is another way of escaping reality (I focus on my pain and my distress instead of focusing on the reality of what I was criticized for). A humble reaction would be totally different. It would imply controlling the pain caused by the sting, while accepting to listen to see if the criticism is justified or not, and in any case learning an ethical lesson from it. Tip No. 5: Just accept. Accept what happens, accept oneself with one’s inadequacies, which oddly leads to a delicious feeling of liberation. The delusional ego is full of emptiness. Humbly accepting one’s position rids the self from this emptiness and in turn leads to a rare and precious feeling of fullness. Tip No. 6: Move forward and, contrary to what one would expect, develop a winning spirit. Humility isn’t about being bitterly resigned to what we are (“I am nothing, just a speck in the universe, so why even try to make anything happen?”). Paradoxically, humility is a driving force that pushes us to develop and to move forward. Humility 1 – which self are we talking about? Oh I have been waiting for tips like this since the first article of humility came. I recently had an experience with someone whom I wanted to start a relationship with. My pride got in the way without knowing and I judged this person, thinking he was playing games with me and just being plain rude. What is so interesting is that I was merely seeing my own reflection in the situation. I was the one who was playing games and not sure what she wanted. Overall, it ended up not working out and I learned some valuable lessons from this: Humility. It is so important and it is indeed so liberating. Pride really limits you to your possibilities and takes you down. It is truly an incurable illness of the soul. This article opened my eyes to many hidden sides of my personality and it’s a great feeling to know a bit more about my true self. I coud clearly see the reason of many of my actions and thoughts, which is pure pride and ignorance. But as the article says it gives a precious feeling of fullness and motivation to move forward. And I’m so happy about it. The “Tips” are awesome and I think I need to read them often. Thank you very much! Wow, I think this is so far for me, if not the best article, is one of the best articles, I have read in this website! So how should one develop a winning spirit? What is the formula? Do we see ourselves with addition ugly thing hanging from our head (an ugly hat), when our ego dilated? For example, we are showing off (we think we are wearing a cute hat, to make our selves pretty or cool). But in reality, it is ridiculous and ugly. Can anyone analyzes the picture please? 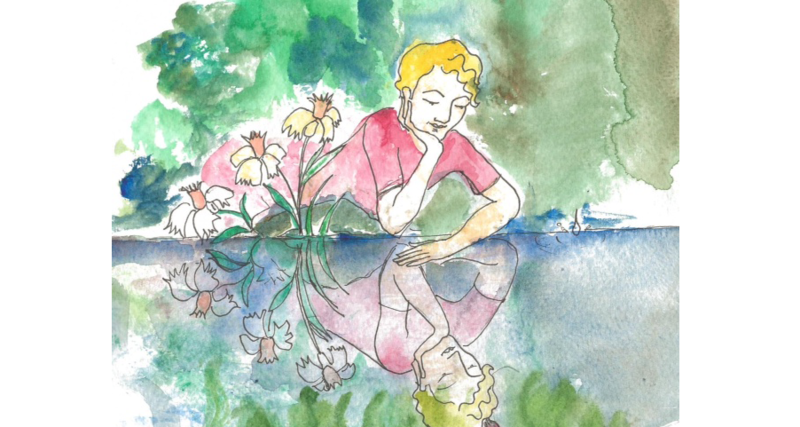 I think the picture is a classic representation of Narcissus, looking at his own reflection in the water of the lake. The hat is just a leaf. But it doesn’t mean that your example is false. I think what you wrote is true, and more, that the same can be said about all for what we show off. Thank you for such a practical, well informed and meaningful article. The picture says a lot too – a reflection of oneself. Look (within) at your self, then judge others – check your actions, reflect, evaluate and act. I think if I checked and continue to check my own reflection, intentions and in turn actions I would not get so upset with others. The thing which is recently making me very motivated to become more humble and smarter ! is to remember the main purpose of life. “The first reason is ethical and refers to what has been called “love of truth”. While it is in my nature to be blind to the true place I hold in the world, it is also in my nature, once I have become conscious of an illusion, to try and free myself from it. No one can content themselves with living knowingly in error without trying to come clear.” … OMG this is so beautiful! I found this article extremely beneficial, thank you so much. A while back I started self-suggesting myself this: look at your material life, and see that you are not the most educated, you are not the most successful, you are not great in any aspect of your life, you don’t even have many of the good qualities that you see in those around you. How can you then think that you could be so superior? It doesn’t make any sense. Initially it was so painful that I didn’t want to even say it, but gradually it got easier and it helped a lot. Once I could feel humble in my life, it felt great; hope, reliance, lightness were all feelings that I hadn’t experienced before, it motivated me to want to develop this quality. I saw the picture like this: a fish kissing a girl’s head. after I read comment #7, I realized how unrealistic I am. After I read this article, I saw more clearly my pride in every thought I have, even the simplest one. Those are scary and ugly thoughts. Thank you for opening my eyes to the true me. Thanks for the fantastic article. The analysis that has been done of pride is really sophisticated and detailed. It is true that pride is omnipresent and that our actions/thoughts are often biased under its influence. We can see that all the time in our personal lives and also by observing others. I will take tennis as an example, analyzing it from the viewer’s and then the player’s perspective. When I stroll around my tennis club, it is quite frequent to hear players shouting and reproaching themselves for not playing at a level commensurate with their capacity or blaming other factors (e.g. tennis balls) to be the root cause of their poor performance. « It is crazy, stop!!! Stop playing like this. This is really crazy! » After reading the article it is obvious that the ego of the person who is shouting suffers from the confrontation with reality, I mean with the fact that they do not play as well as they think they are. And they also suffer because they feel (or imagine) people are watching their suboptimal performance. By complaining they try to reassure others (and themselves), that their poor performance is only transient, just a simple incident and that they really play much better. But, if you watch the person playing several times, you will usually see that they do not play any better and complain often. In other words, they always believe that they can play better than how they really play. Thank you for this eye opening article. It has unmasked a powerful concept for me in simple terms. Hopefully I can truly look inside myself, learn, practice and strive to better manage my ego on a daily basis. Read the article again and again. I think in every situation, if we check ourselves in, and apply the tips no. 1-6, think about it, analyze it, write it down, identify ourselves, learn from it, and move on, that is the winning sprint. – attention is key for starting off the experiment – otherwise I don’t even think about watching my words. But why ? Is it necessary ? Is it useful ? Why not ? What is my goal ? One day I stopped what I was about to say but my “thought attacks” were so ferocious that it popped out 1 min later. Ok, next time, it’ll be two minutes ! Thank you for your experience but I’d be interested in knowing more about the context and method. 1. Was the feeling of superiority a symptom of a lack of hope, lack of reliance, etc. or the other way round, or something else ? >THE SECOND REASON IS PSYCHOLOGICAL. IF WE THINK ABOUT IT, PRIDE IS THE ORIGIN OF MOST OF OUR >PSYCHOLOGICAL SUFFERING. Recently I have lived through an experience which has profoundly influenced me, where I really felt the powers that govern my psychospiritual organism. What is interesting is that, until a short while ago, I had the impression that this flaw had been treated and I thought I could lower my guard and worry a little less about my pride. I, in fact, felt I had suffered enough and had already made enough efforts (my professional changes had lead me to endure very difficult situations). But this was without reckoning with the other manifestation of this same flaw: the fact of feeling at the centre of the world and not just at the top (see http://www.e-ostadelahi.com/eoe-en/humility-3-detecting-characteristics-of-consubstantial-pride-within-oneself/ ) and it was also without reckoning that the big flaws, those that are rooted deep within us (such as pride as far as I am concerned) request a lifetime’s work. The way I became (again) aware of this other hidden side of pride has really affected me. Here is my brief story: there is a person I am really fond of, whom I really admire, whom has done a lot for me, who is also a role model, and whose mere presence is a source of joy (for me). This person is also extremely (extremely, extremely) busy. And it had been a year since I had last seen him, until the day when I finally found myself in front of him. And it is there that, to my great surprise, I was overtaken by coldness and indifference. overestimating my ability makes me miserable because I want to do everything myself (you know I’m the one and only!)…. It is so interesting that you have tennis as an example. A friend of mine shared an experience with me that had to do with tennis as well. She was very sick and had to play a game with her partner. She is usually very hard on herself and like you mentioned, she always gets mad at herself for losing a match because she thinks she is better. That day, she was terribly sick and she told me that all she was thinking about was the fact that she was not going to be so hard on herself and just do the best she could possibly do. For the first time, she was relaxed and calm before the match. It was as if she put all the pride and expectations aside in this game. Funny enough, she ended up playing the best match she has ever played in many years. For her, it was so interesting. She was so sick and yet, because she was forgiving of herself and played in a humble and self-forgiving way, she was able to move past that and learn something interesting about life. Thought I would share as well. Something interesting I experienced when putting into practise some of those tips is how my pride only felt “real” after I started practising. I had acknowledged and understood in theory that I was self-centred and much too often felt superior to others; I had also understood that it was most likely my pride that made me so shy and scared. But only in theory. And deep down, I still believed I wasn’t doing too bad and was generally quite humble. My understanding of my own pride took a whole new level when I started trying to spot judgemental thoughts or thoughts of contempt toward others and fight against such thoughts (tip n°2), and when I started analysing my reactions to criticisms and trying to adjust them (tip n°4). I still have a long way to go in terms of understanding and practising humility, but one thing I can share so far is that more than ever I experienced how theory alone is not enough and that actual, real, understanding can only come with practise. It can be quite scary and/or painful, but it’s definitely, definitely worth it. 1. This superioritism is the cause of many of my negative thoughts and behaviours throughout the day. For example I tend to think I’m right, I don’t listen to others, I show off a lot etc. In the past every time I thought about humility and the fact that I am nothing, I used to loose hope and feel down about myself. One day after doing my prayer, I thought about the same concept, but this time I felt very happy, very comfortable, as though it was okay to be nothing, and at the same time I had hope and reliance. It felt as though a weight had been lifted from my shoulders. I realized that lack of hope and feeling down about myself is just another face of my pride. 2. I thought about both the positives and negatives. With regards to positives, I self suggested how all those are more than what I deserve. thank you for this great article: it helped me identify a problem in my psychospiritual organism. For 7 years i’ve been basically thinking: “I am in the center of the universe since everyone is looking at me with admiration”… Thank you so much. I love how this teaches me to be humble and yet it is all about an internal conversation. I was/am struggling so much with the fine line of being humble and yet standing up for your own rights and respecting your wants and needs. I would think to myself how I would practice humility towards others while not letting them take advantage of me and my “kindness”. After much contemplation and reading the material over and over I now realize that this is in the first and most important step and internal conversation one has with themselves. It does not start with others but with me and how I think about myself and my expectations of the world around me. I love it, and thank you. Thank you for sharing your experience. It helped me identify one of the sneaky places my pride has a tendency to hide. At first all I knew is that your experience rang a bell with me and as I thought about it and tried to put the tips into practice, I realised how I could manipulate a situation to create a drama in which I become the centre of attention, while I am actually convinced the others are responsible for that drama! Examples include doing my work so close to the deadline that I become the centre of attention to even the office cleaner (who ends up having to clean around me AND sympathise with my having to work so hard!! ), or something as silly as making an issue out of a colleague criticising the type of food I eat, which means the whole lunch hour is focused on me—this may be followed by taking the matter home with me, discussing it with loved ones and again becoming the star player in my stupid drama. To what end? It all became so clear after reading your experience! And this realization was followed by a wonderful sense of happiness and real motivation to continue putting the tips into practice. Thank you, A, for the reminder that this is a matter of lifelong work and that pride will manifest in so many different ways. i am feeling tremendous remorse for some past behavior. is the inability to move past these mistakes a symptom of pride? I am starting to see some things that I didn’t realize before. Especially with regards to a personal problem I have had for a number of years: a sort of “obsession” with being thin. For years I have been obsessed with how I eat, what I eat, how well I eat, how poorly I eat, all with the aim of being very lean and thin so that clothes look nice on me. However, it doesn’t stop there – I also would like to be the thin-EST. not just thin. but thinnest – the person with the nice-EST physique in the room – be it at work, at the mall, at a family gathering. I never realized the extent to which this pride has created such an agonizing complex within me. I thought this problem was the fault of society – all the magazines and tabloids and tv shows that put pressure on women to look a certain way (and to an extent this may be true) – however, my problem is no different than wanting to be the rich-EST or smart-EST or funny-EST. I suffer from this complex to this day (and this has been an issue for me for years). I would love to hear your thoughts or suggestions on how to correct this so that a) i can live with more peace (right now every day is a struggle when it comes to this issue – i.e. not wanting to go out because I beleive i may have gained 2 pounds), and b) get a hold of my pride that is causing all of this within me because I am sure it translates in other areas of my life as well. * Read about feminism and women empowerment. * Learn more about photoshopping images and the age of the models to understand that the ideal weight for women is done by using teenage models and photo editing. * Travel and see that ideals differ in different cities and countries. * Work with obese children and understand that they are suffering a weight and health problem and not you. Help them and come out of your own head. * Examine your self esteem. See if you need to feel pretty to feel that you are good enough for so and so. See what other parts of yourself you can improve to boost your confidence. Maybe volunteering. Maybe going after your dream profession. Perhaps you need to fix bad relationship with parents etc etc. See a psychiatrist. Maybe you were bullied as a teenager and you still believe in those words. Find out what the real cause to this obsession is. * Remind yourself of what is truly important in this life. To help others. To work on yourself. Remind yourself that you will not bring your body to the other world (if you believe in another world). That taking care of your body is important but that your obsession is making you vain and shallow. * Pray for others and wish for them what you wish for yourself. At first just use autosuggestion until it actually can become heartfelt. The list can go on and on and these are just some of my suggestions but I’m sure you can come up with your own if these don’t help. The imperious self attacks in many different ways and therefore you have to attack it back through many different ways. I hope this was helpful and best wishes to you. I think that like you say, wanting to be pretty is not a problem at all, on the contrary, especially for a woman. The problem lies then in the degree, like every natural impulse inside us moreover. In order to see if it’s too much (because you seem sure that it isn’t not enough), for each manifestation of this problem in your life (because the correction has to be made toward an balance and that’s subtle), I think you have to see the cause (specially the intention) and the effect (on yourself, i.e. your dignity and on others). For example, for the cause, if your intention is to attract a married man, or to make the other woman become jealous, you can see that this is contrary to your human nature. But for example, if you want to attract a single man, that you are single yourself, and that he has also another woman in mind, I don’t think it’s unethical to want to be prettier than this woman, on the conditions that there is some fair play (I mean no hatred, no cold heart, but a fair competition between gentlewomen, and if the guy ends up with the other one, be happy for her, act accordingly: that mean if they have a couple problem try sincerely to help them to agree etc.) and that you don’t behave or dress in a way that is contrary to your dignity. And here come the effects. You detected pride as a cause and a social problem as an effect. I think the most efficient way to go about it is to begin with perhaps little but very practical acts that would be predetermined. Because acting “live” leads to a lot more confusion and imprecision than when you think rationally in advance. For pride, if it is against other women, first do not worry, it is a common struggle for women. Then keep a logbook with a program of predetermined actions that go against this natural instinct of rivalry. It is hard to give general tips because there are many cases (it depends on the relationship with that woman). For example, you could, once a day, compliment another woman on something (dress, haircut, …) in front of others (of course, it has to not be obvious that it is false, or worse, that your have a more beautiful haircut, the real intention would then be to have everyone be focused on your haircut…). If there is a relation of explicit rivalry, show affection to the extent possible. And each day note the results: have I said something that made someone else feel beautiful or loved etc. today like I had decided to ? Independently to other women, for example, you forbid yourself once a week to wear lipstick, or once a week you wear a dress that doesn’t make you look ugly but that doesn’t make you look so beautiful either. As regards the effects, when you go out, you could force yourself each time your are invited, or once a week, or something, to go out for dinner, and you could also decide on a frequency at which you force yourself to order the same meal as the first person who has chosen, etc. Of course all of that depends of our life style and it shouldn’t make you ill either. But you should decide all of that before and after you just apply without thinking, and then note the results. And you cannot change the program during the week, but only at the end, depending on the results. Or is the obsession itself a problem because it occupies your mind? Then, do you have a favourite meal that you do not eat because of that? If yes, force yourself once a week to eat it, and try with experience to appreciate eating this meal that is so good. If not, pick one, make discoveries (once a week in a new restaurant?). The best is to find daily practices, but in your case, it’s difficult because it must not be too much either. If you really do not eat enough, or if you’re not sure, see a nutritionist that will have a professional view on your case, and give you an eating program, that you would have to respect. And ask God / the One (depending on you beliefs) to help you. And if you want Him to help you, your have to spiritualize this problem, to see it spiritually (from you inner guide, or profound conscious self): ask yourself each time why you are going through all this struggle and what for. It has to be a spiritual goal. I can not thank you enough for your thorough responses and feedback. I read and re-read your comments and suggestions and I plan to come up with a plan. I was checking this site every day in anticipation of response from fellow readers for guidance. I am tremendously grateful that you have taken the time to provide me with your thoughts and suggestions. I’d also like to ask you to please continue to do so should anything new come up that you believe I may benefit from.